Look through this window into the past on the shore of beautiful Salt Fork Lake. This lovely Stone House has been restored to its 1840’s appearance compete with a summer kitchen and existing unique root cellar. The summer kitchen, built adjacent to the main house, lessened the possibility of fire and also kept the main house cooler in the summer. The kitchen was used year round for the preparation of food, as well as butchering and canning. The ox yoke on display above the fireplace was worn on oxen that hauled the sand stone to the site by the Irish masons who built the house. 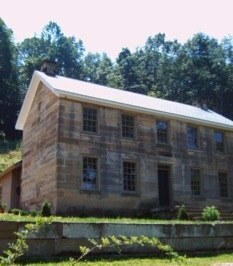 Benjamin Kennedy at the age of 23 in 1837 purchased an 80 acre tract of land on Sugar Creek and commissioned the building of a stone house. The stone blocks, quarried on the property, were finely crafted and tightly fitted. The house and root cellar nearby cost $600, a bargain, even in those days!! In March of 1999, ten people formed a group with the goal of restoring the House. 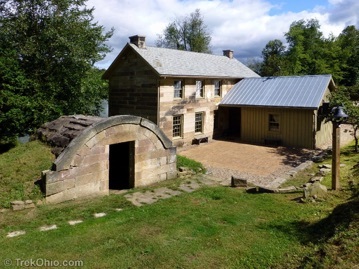 The Friends of the Kennedy stone House Salt Fork State Park became a chartered organization n 2002 and obtained 501(c)(3) status, which means contributions to this worthy cause may be tax deductible. The Friends are the core group behind the restoration, and have been joined by many volunteers. ROGER AND CONNIE BROCIOUS, DOCENTS FOR THE KENNEDY STONE HOUSE MUSEUM AT SALT FORK STATE PARK HOLD THE CONTAINER OF ENTRANTS WHILE LUKE ROSE, XANTERRA RESORTS REPRESENTATIVE DRAWS THE WINNING TICKET. ONCE AGAIN THIS YEAR, IN SUPPORT OF THE KENNEDY STONE HOUSE MUSEUM, A RAFFLE WAS SPONSORED BY XANTERRA RESORTS IN WHICH THE WINNER WOULD RECEIVE A LUXURY STAYAT ONE OF THEIR LAKESIDE CHALETS AT SALT FORK STATE PARK. 242 RAFFLE TICKETS WERE SOLD THIS YEAR AND THE PROFITS FROM THE SALE OF THESE TICKETS THROUGHOUT THE SUMMER WENT DIRECTLY TO SUPPORT THE MUSEUM IN ITS EFFORTS TO REMAIN ONE OF GUERNSEY COUNTY'S MAIN ATTRACTIONS. THIS YEAR MIKE BAUMGARTNER OF MEDINA, OHIO, WAS THE HAPPY RECIPIENT OF THE WINNING TICKET.